We are calling all local organisations in the area to send one or two representatives to this meeting to see how they can help and support each other with ideas, good practice and even equipment. If you hold public events, you need insurance, which can be expensive, so come and explore ways to see how groups can club together to ease costs, possibly share events and also avoid dates that clash. Fund raising, writing constitutions and running bank accounts can also cause problems for new groups – come and learn from the established groups in the area how they solved these issues. Existing groups are welcome to use a table to demonstrate what they do. Members of the public are also welcome to come and meet the people running the amazing and diverse organisations in our locality. Mill Hey has had a major flood on two previous occasions: 10th August 2004 and 20th September 1946. A new book by Helen MacEwan explores the life of the Brontë biographer Winifred Gérin, who lived in Haworth in 1955-65 while researching her biographies. Winifred Gérin (the name was that of her first husband, a Belgian cellist) became a biographer after a first visit to Haworth in 1954 at the age of 53, having previously tried poetry and playwriting. Haworth completely bowled her over. She felt that it was only now, having seen the Brontës’ environment, she was beginning to understand them. On that first visit she met her second husband, John Lock, also a Brontë enthusiast and keen walker. The following year they married and moved to Haworth, where they bought the house in West Lane that still bears the name they gave it, ‘Gimmerton’. She and John Lock walked the moors in all weathers to gain the authentic Brontë experience. Between 1959 and 1971 Gérin wrote lives of all four Bronte siblings, starting with Anne, the least known of the quartet. 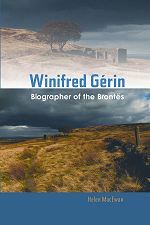 They were for a long time the standard biographies; before Juliet Barker became ‘the’ Brontë biographer with the publication of her book on the family in 1994, Winifred Gérin was often considered ‘the’ Brontë biographer. Her husband John Lock wrote the first biography of Patrick Brontë, A Man of Sorrow (1965). The story of how Gérin discovered both her vocation as a biographer and second love on her first visit to Haworth is a romantic one. But it forms just part of an eventful and romantic life. Her childhood and youth, rather like the Brontës’, was characterised by an intense imaginative life shared with her sister and two brothers, and by family tragedies (the loss of two siblings in early life). In the 1930s she lived in Paris with her Belgian musician husband. They were in Brussels when the Germans invaded in May 1940 and in the first years of the War had a series of hair-raising adventures in Belgium, France, Spain and Portugal. Trapped in France for two years, the couple became involved in helping Jews to escape arrest under the Vichy government. Having finally managed to escape back to England, they worked for Political Intelligence near Bletchley Park. Gérin also wrote a life of Elizabeth Gaskell, among other writers. This book, which makes her life story known for the first time, is based on her letters and her unpublished memoir. Helen MacEwan lives in Brussels, where she runs a branch of the Brontë Society. She is the author of The Brontës in Brussels, a guide to Charlotte and Emily’s time in the city. She first became interested in Winifred Gérin because of Winifred’s links with Belgium, and was able to meet the Gérin family and read hundreds of letters written to them by Winifred over 40 years. She often visits Haworth for Brontë Society events. While researching Winifred’s time in the village she was helped by contacts in Haworth including Steven Wood. The photo for the book cover was provided by Ian Palmer. Update 11 September 2017 Haworth Fire Station has been bought by a private company for £340,000; £65,000 above the asking price. Update 24 July 2016 The Fire Station is now on the market bringing an end to 200 years of Fire Fighting in the Worth Valley. Join the March this Saturday 20th December, meeting at Haworth Fire Station at 1pm This is about everyone in the Worth Valley which Haworth Fire Station has served. Image left; March on 20th December 2014. Haworth fire station is due to close at midnight 31st December 2014. Local people are trying a last bid attempt to stop its closure, this is the last chance, once it has gone it will end 148 years of fire service for the people of the Worth Valley. If you care about the safety of our villages. please join in the march this Saturday and show your support. That the Clerk make as much inquiry as possible about the cost and practical working of fire engines and order one as soon as possible. That the fire brigade be allowed £5 a year as remuneration for keeping the engine and apparatus in efficient working condition. The Clerk also read a letter from the captain of the fire brigade of which the following is a copy. I wish to bring before you the following for your consideration. We are in want of 200 yards of canvas piping, a new set of suction pipes, one new stand pipe, and the old one repairing that was broken by the surveyor so that he can use it any time without fetching ours. If we get the new piping the surveyor can have one or two lengths of the old for his own use as we wish to have ours to ourselves. Also we wish you to grant us £10 a year instead of the five you have granted us so that we shall not have to go round at Christmas. Waiting for your reply I am gentlemen your humble servant. That as the Board have at present a Fire Brigade and appliances, and are considering the advisability of purchasing a new apparatus they at present decline to join in the formation of a joint Fire Brigade with Bingley, Oakworth and Oxenhope Local Boards. That the number of firemen be increased to 10 and two of them live at Cross Roads and be responsible for keeping the equipment there in good order, and two to be responsible at North Street and the remainder of the men be responsible for the apparatus at Belle Isle. That a contract be entered into with the National Telephone Company Ltd and for telephones and alarm bells for fire brigade purposes as per their specifications A & B. in the sum of £28, and that three firemen live at Cross Roads and three at North Street within 300 yards of the respective fire stations instead of two in each case as set out in minute of Council, 4th January, 1910.
that the old tool house behind the Council's offices be altered and made suitable for central fire station and that the Fire Brigade Sub Committee be empowered to carry out the work necessary at an estimated cost of £12. That a letter of sympathy be sent to the family relations of Garnett Walton, a member of the Council's Fire Brigade who has been killed in battle in France. That the Chairman of the committee and Messers Wood and Whitaker look into question of repairs to doors at fire station, North Street, obtain tenders for the work and report to the next meeting of this committee. That a letter be sent to the Fire Brigade Superintendent, John K Toothill, on the resignation of his office, thanking him for his 40 years service under the Council. That application be made to the Council for permission to rent the Belle Isle depot from the highways Department, for use as a Fire Brigade station. That all Fire Brigade apparatus be removed to Mill Hey station forthwith. Result for the Worth Valley Council Election held on Thursday 22nd May 2014 for the Worth Valley Ward: Conservative hold Worth Valley. Haworth Fire Station survival plan goes to the next stage. Cllr John Huxley, Chairman of Haworth, Cross Roads and Stanbury Parish Council and Cllr. Neal Cameron, chairman of Oxenhope Parish Council representing the Worth Valley Joint Transport and Emergency Services Committee met with West Yorkshire Fire and Rescue Authority’s Community Safety Committee to discuss the future of Haworth Fire Station on Friday, April 25th. And the Community Safety Committee agreed a package that will enable the Parish and Town Councils from the Worth Valley to go to the next stage in their attempt to keep Haworth Fire Station as an emergency service centre for the valley and develop it into a safety hub for the whole valley. 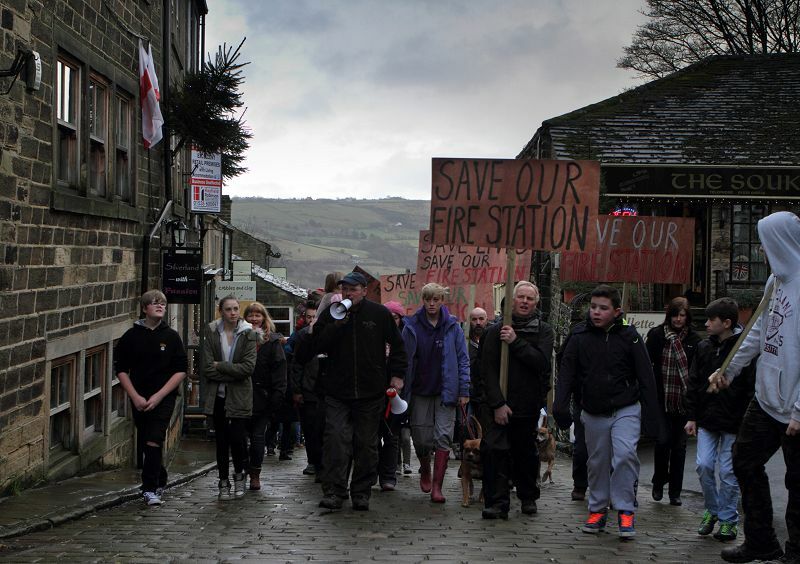 In December 2012 the Fire and Rescue Authority approved a two-year moratorium on the proposed closure of Haworth Fire Station in order that discussions with Parish Councils in the valley concerning a community-led rescue plan could be fully explored. Since that time discussions between Fire and Rescue’s senior officers and the Worth Valley Joint Transport and Emergency Services Committee have been taking place while various models and propositions were fully explored. In January 2014 a conference concerning the future of Haworth Fire station and the community plans to keep a fire service presence in the valley as well as the creation of a centralised ‘blue light’ hub for the valley communities were explored with representatives from the Police, Fire and Rescue, Hill Rescue, District Councillors and Bradford Council officers. What emerged from the conference was a blueprint for a community takeover of Haworth Fire Station building at the end of 2014 when it is scheduled for closure as a station manned by retained, part-time fire-fighters. The take-over by the community involves the creation of a volunteer-run service that would be fully trained in fire prevention and other community safety skills. Ultimately it is hoped that the Centre could deliver the ambition of working with West Yorkshire Fire and Rescue Service to gradually increase the skill-base to a point where a volunteer fire-fighting unit, complimentary to the full-time fire-fighting team at Keighley Fire Station could be established. If successful, this would be the first of its kind in West Yorkshire, although volunteer fire stations do exist in other parts of the UK. Central to the discussions about the Fire Station’s future has been its development as a hub for not only Fire and Rescue within the Worth Valley but also its development into a base for Neighbourhood Policing and for the Calderdale Hill Rescue Service, who are responsible for the provision of safety cover from Calderdale as far north as Ilkley Moor. Now the three local councils involved in the battle to keep Haworth Fire Station open through the Worth Valley Joint Transport and Emergency Services Committee: Haworth, Cross Roads and Stanbury Parish Council, Keighley Town Council and Oxenhope Parish Council will have an opportunity to discuss in detail the package that the Fire and Rescue Authority are making available to them. Cllr. Huxley, chairman of the Worth Valley Joint Transport and Emergency Services Committee, said: “We've been working very closely with the senior officer team at West Yorkshire Fire and Rescue to create a business model that would enable us to retain Haworth Fire Station as a sustainable and viable service centre for the Worth Valley communities. “It has been a long process because there was no similar model in the country we could study. It’s a ground-breaking concept and what has become clear is that if we succeed in making it work it could provide the basis for other similar community-run schemes for rural communities faced with the loss of their local fire station. Now the plan will be tabled fur discussion at Haworth, Cross Roads and Stanbury Parish Council’s next meeting on Tuesday, May 6th; Keighley Town Council’s Watch and Transport Committee on Monday, May 12th and Oxenhope Parish Council’s meeting on Wednesday, May 14th. Deputy Chief Fire Officer Steve Beckley said: “We are pleased to be able to support the Worth Valley Parish Councils in their desire to retain some kind of community safety services at Haworth fire station. We already use volunteers to support our community safety activity in some areas and this project offers an exciting opportunity to formalise a true partnership where local people contribute to keeping their community safe by preventing fires and other incidents such as road traffic collisions. “The Worth Valley is a very safe place to live work and visit and we want to keep it that way. Emergency cover for the Worth Valley will continue to be provided by our professional firefighters at Keighley and Bingley, supported by other fire stations”. Harry Gration, Amy Garcia and Paul Hudson of BBC Look North visited Haworth on March 18th, cycling on a tandem raising money for Sport Relief. Stage Two of the Grand Départ starts in York and travels through Knaresborough and Harrogate before entering the Bradford district, racing into Addingham from the roundabout at Bolton Abbey before it heads to Silsden. The route goes through the centre of Silsden, over the canal and out along the main road and onto the A629 by-pass to Keighley. Once at the roundabout the cyclists take a right onto Hard Ings Road and left at the next roundabout heading in to Keighley via Skipton Road. The route goes through Keighley on North Street and South Street, before heading up to Cross Roads. From Cross Roads the riders will travel downhill to Haworth before tackling the cobbles of Haworth Main Street. Once at the top of Haworth, the riders head along Changegate, turning left into North Street before entering West Lane towards Stanbury before turning left to ride along the dam of Lower Laithe reservoir and on to Oxenhope. From Oxenhope the route goes left on Hebden Bridge Road and heads out of the district to Hebden Bridge. The final part of Stage Two sees the riders tackle Cragg Vale before passing through Huddersfield and Holmfirth and taking on the Holme Moss climb and the final descent into Sheffield for the finish. Please note: The Caravan will not be travelling up Haworth Main Street on the cobbles but will use Rawdon Road. To facilitate Stage Two of the Tour de France 2014 the roads listed below must be closed from very early in the morning on the Sunday for a minimum of eight hours. Road closures and various forms of temporary traffic management will also be deployed on other roads in the Bradford district leading to the race route to facilitate the safe movement of motorists, pedestrians and cyclists to the various spectator points along the race route. We are working with partner agencies and landowners across the district who are identifying temporary car parks, campsites and events. Further information about these road closures, one-way systems and restrictions on the movement of vehicles will be released closer to the event. Where can I view diversion and access routes? Diversion and access routes are being developed as part of the traffic management plan. Further details will be provided closer to the event. Why can't you specify road closure times? Roads will need to be closed for a minimum period of eight hours, but given the anticipated number of visitors, it is likely that the roads will be closed for most of the day. Roads will be re-opened as soon as it is safe to do so. We need to make sure that spectators have had the opportunity to move from the roadside, that race infrastructure can be safely removed and any highway infrastructure (such as traffic signals) that have been temporarily removed can be reinstalled. We expect the majority of roads to reopen by the evening of the race. However, some may be later. When will I be told if my street is affected? We are aiming to publish details of road closures within the next few months. Please be aware that although your road may not be closed there is likely to be heavy traffic and congestion in areas around the route. When will it all get back to normal? Once the event has finished we will open roads as soon as possible. Please bear in mind that we will need to allow for spectators to leave the area, people cycling behind the race and the removal of barriers and infrastructure along the route. The race route roads will be closed to traffic at 7:00am on the day of the race, 6th July 2014. It is not known exactly when they will re-open, as it is dependent on the volume of traffic in the district. If you are away that day you need to plan for getting out of Haworth before 7:00am and be aware that there may be traffic problems at that time. All vehicles have to be removed from the race route, any vehicle parked after 7:00am will be towed away. Bradford Council are looking at areas where residents who normally park on the race route can park at another place. At about 11:00 am there should be a caravan parade which is made up of sponsor vehicles which lasts about 1:30mins, at the meeting it was explained that there may be logistical problems for it to follow the race route; Main St may be too narrow for some vehicles to negotiate safely. An option being considered is using Rawdon Rd for the vehicles, or it may have to use the Hebden Bridge Rd. Bradford Council are in discussion with the TDF organisers to resolve these issues. The narrowness of Main St for the cyclists was explained, and is being reviewed as the best way to manage. One option is to barrier both sides to keep the route safe for cyclist and pedestrians. Bradford Council are in discussion with the TDF organisers about this. The times of the Tour de France have been announced. The riders will pass through Haworth at about 1:00pm. See: http://letour.yorkshire.com/timings for full race timetable. Yorkshire Festival 2014 was launched at the Lower Laithe Reservoir. It is advertised as the biggest art festival in the counties history and will start on 27th March, the 100 days leading up to Tour de France. The full festival programme is due to be released on 29th January. The route takes a right off the A629 Halifax Rd at Cross Roads roundabout on to the B6142, past Lees, on to Mill Hey, Station Rd, up Bridgehouse Lane, left, up Haworth Main St, right fork at the TIC on to Changegate, turn left on to North St, on to West Lane, down to Sladen Bridge up towards Stanbury, take a left on to Reservoir Rd, over Lower Laithe reservoir, past Penistone Hill to Moorside Lane, Shaw Lane, to Oxenhope, right on to the A6033 to Hebden Bridge. Haworth, Cross Roads and Stanbury Parish Council will be launching a major piece of work that could a major impact on development within the Parish on Monday, March 10th. The Parish Council, working together with key members of the community, have established a Working Group that will start work on its projected Neighbourhood Development Plan which will give the Parish the powers to say what kind of development will be allowed in the Parish: what it looks best like and where it is placed. Under the Government’s Localism Act 2011 powers were given to Parish Councils to put together Neighbourhood Development Plans so that communities could have a greater say in the Planning policies that affect their areas. The Parish Council was approved as the appropriate authority to deliver a Neighbourhood Development Plan by Bradford Metropolitan District Council in November 2013, a step required under the Localism Act. Cllr. John Huxley, chairman of Haworth, Cross Roads and Stanbury Parish Council, said: “This will be one of the most important pieces of work ever undertaken by our Council. “While it will not give us the powers to refuse Planning permission for developments, it would give us the opportunity to shape where housing and business development is allowed and what any kind of development looks like. “This is a project that should matter to anybody who cares about the future of Haworth, Cross Roads and Stanbury. Bradford Council’s Local Development Framework – their plan for the future – projects that Haworth should provide land for 500 houses in the next 25 years. The Working Group will be staging a number of consultation meetings which will be open to the public, as it seeks to provide evidence of what people in the Parish think about what development should be allowed and where. Added Councillor Huxley: “Part of the process is that we have also to consult with the business community; land-owners and property developers so we shall be looking to engage with them too as we build our community’s vision for the future. “The Government are asking us to plot a sustainable future for our Parish and we are required to keep the community fully informed about what work we are doing. “Today we are launching a publicity programme designed to engage with as many people in the Parish as possible. 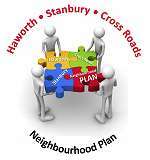 We have established our own web site www.haworthcrossroadsstanburyndp.org.uk and a Facebook page www.facebook.com/haworthcrossroadsstanburyndp while we shall be issuing regular bulletins via the Parish Council’s newsletter and all the varied media sources in the area. 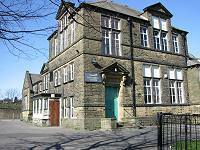 The first public consultation meetings for the Plan will be staged at St Gabriel’s Church, Stanbury from 10.00am until 12.00pm on Saturday, March 15th and this will be followed by further consultations at West Lane Baptist Church, Haworth from 10.00am until 12.00pm on Saturday, March 29th; St James’ Church, Cross Roads from 10.00am until 12.00pm on Saturday, April 5th and then back at West Lane Baptist Church, Haworth on Wednesday, April 23rd from 7.00pm until 9.00pm.